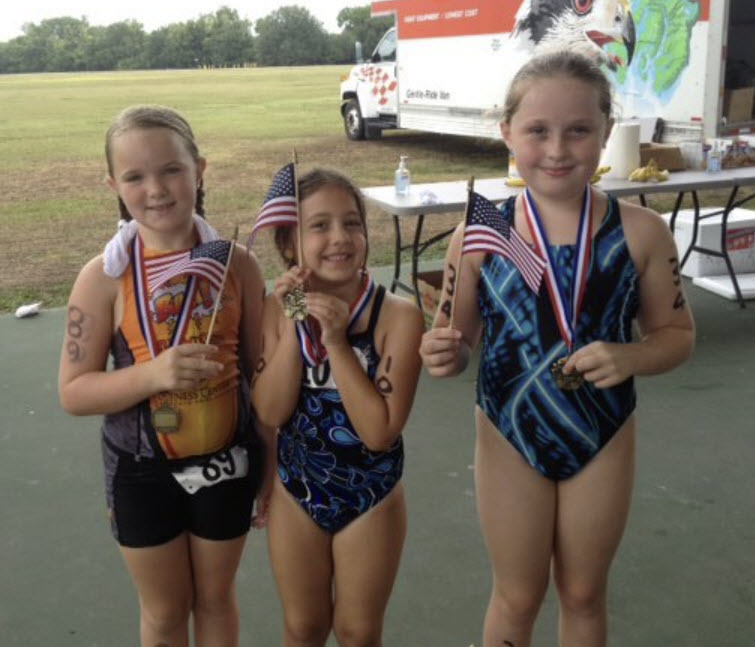 Cassie did a local triathlon sponsored by the Kiwanis Club. 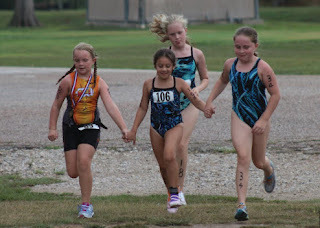 They have a whole series of Kids races throughout the Houston area. She had tons of fun and did well. She's downright giddy on race days. 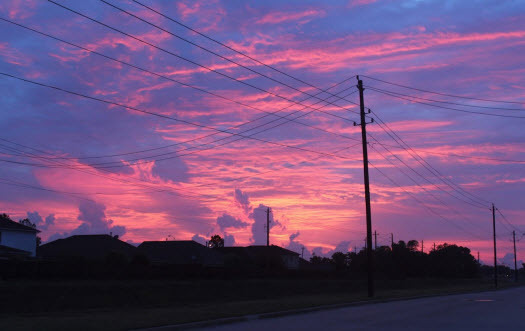 She gets right up and ready, faster than ever, as if just rising from the bed was a race too! She got into the water for a warmup -- she must have did a 300m warm up for a 50m swim! LOL She was having a great time and I could tell she really wanted to be there. She's improving so much and I get inspired when she gets something in her head that she wants to make better and does. 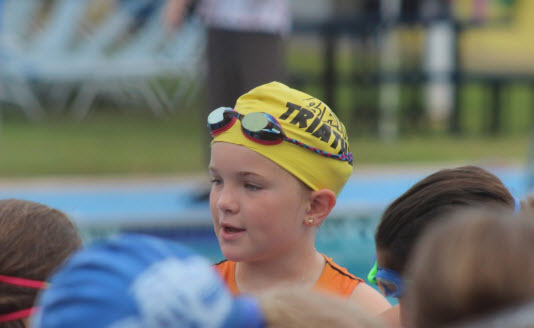 This was the first race where she was 1st out on the swim! She was so proud! 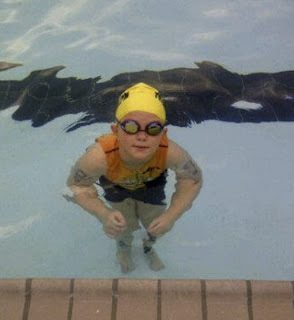 In fact when they started it didn't even look like her swimming! She was aggressive, attacking the water like a more seasoned swimmer. Cassie and another girl took a quick lead then she just kept increasing her distance between 1st and 2nd. I thought for sure she'd slow down 2/3's of the way out, but she didn't. She stayed strong! 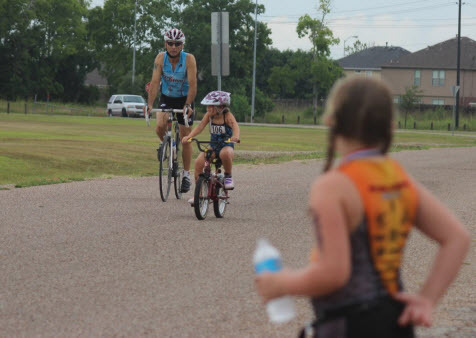 She spent a little too much time in transition, and gave all the kiddos she beat out of the water a chance to leave on the bikes ahead of her. No matter though -- she was still smiling and having a great time. She headed out on the bike nice and steady, no wrecks! 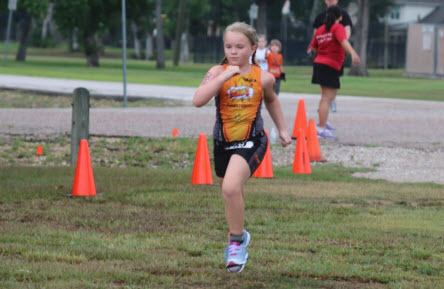 She made a super fast transition to the run and pushed it the entire way! I think she was surprised by how good she felt too! After she finished (13 minutes), she ran into a couple of kids from swim team and also had a friend of still out on the course. 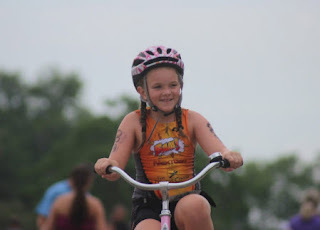 Cassie was still full of energy and ran out to the bike course to cheer her friendon as she rode. Then the swim team friends and Cassie ran out on the run course to help run their friend in. 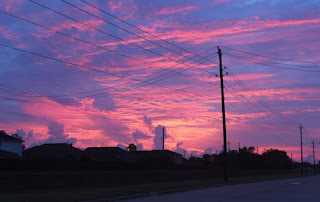 It was soooo sweet. I love the spirit. I gently explained to her, if she wants to "place" that she has to work on the weaknesses, and the rewards will come in time. She asked me what she could do better, and truthfully the biggest improvement she could make would be her transition from swimming to biking. 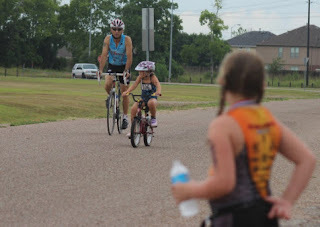 I explained to her that in the time she took to get her sneakers on, all the kids behind her on the swim left on their bike (she was in transition for more than 2 minutes). Immediately she said, "Making a better transition is my goal, now, Mommy." The fact that she "got it" so quickly was so awesome. She's one tough princess. In this life you don't get anything handed to you. 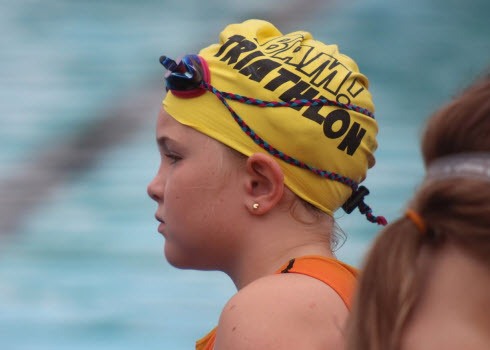 I think she'll learn those lessons through her triathlon racing and swim team. I don't really see the point of organized sports where they award everyone essentially for just signing up. Where's the lesson about working hard to achieve goals in that? Well I think she did an amazing job out there too, especially going back and chearing her friends on. That is so important!!! shed a tear when I saw the picture of the girls running their friend in! What a great event for these kids to have. I totally agree with learning life lessons! way to go! what fun! sounds like she's learning a lot and having fun at the same is icing on the cake! !